A recent issue of Philosophical Transactions B - "Opening the black box: re-examining the ecology and evolution of parasite transmission", compiled and edited by Joanne Lello and Andy Fenton, is now completely FREE to access! ‘The secret lives of parasites’: attend the talk at Cardiff University! On 4th April 2018, Prof Robert Poulin from New Zealand will be in Cardiff to talk about: “Evolution of the body snatchers: the secret lives of parasites”. The talk will be at Cardiff University, Main Building, Wallace Lecture Theatre 6-7pm. Members of the public are welcome to attend! The DeWorm3 collection provides evidence and methods within the STH elimination landscape. Breaking the transmission of soil-transmitted helminth (STH) infections may require community-wide mass drug administration (MDA) over the standard approach targeted at pre-school and school age children, according to ongoing research presented as part of the DeWorm3 Project, led by the Natural History Museum in London. Judd Walson, Principal Investigator of the DeWorm3 Project and Associate Professor at the University of Washington (USA), together with colleagues from DeWorm3 global partner network, present a PLOS Neglected Tropical Diseases collection focused on interrupting the transmission of soil transmitted helminths (STH). The collection provides new evidence regarding the scientific rationale for transmission interruption, epidemiological background information, feasibility modelling, and new methodological approaches that could be applied in areas where STH targets have transitioned from control to elimination. Did you know that the BSP has a YouTube channel hosting content from our meetings and symposia? Our YouTube channel hosts videos made at BSP meetings, including this one describing the benefits of BSP membership, filmed at our Cambridge Spring Meeting, and this one of a debate session held at the Salford symposium of 2014, entitled 'A Scientist's Perspective on Ebola and the Spread of Infectious Disease'. For the first time in 2017 the entire Autumn Symposium (held at the Linnean Society in London, September 2017) was videoed. The talks are now posted as a playlist on the YouTube channel. Autumn Symposia are traditionally relatively small, intimate events focussing on particular subjects areas, but some BSP members have expressed an interest in being able to attend 'remotely' if they cannot make a symposium in person. We are therefore trialling a fully-filmed symposium, and would welcome feedback from our members. The British Society of Immunology (BSI) has recently conducted a landscape review of immunology careers. This was conducted to better understand the career progression of immunologists and the factors that may affect this. The report based on this work was published last week, and there are several findings that might be of interest to BSP members. The full report can be accessed here. In the area of equality and diversity, BSI found that immunology employs a high overall percentage of women, but they are disproportionately numerous at junior levels and are less likely to hold senior positions than women in other similar disciplines. Additionally, there were several discrepancies between the concerns and experiences of women in immunology and those expressed by men. Most concerningly, they found that 13% of respondent stated that sexism, discrimination or bullying were significant barriers that they had faced during their careers, with women reporting this as a factor twice as frequently as men (16% vs. 7%). Those interested in the report's findings can to get in touch with the BSI to give their feedback and ideas for what can be done to resolve some of the issues highlighted. Meeting reports on the BSP Autumn Symposium 2017! The 2017 BSP Autumn Symposium was held on Thursday 28th September at the Linnean Society, Burlington House, London. BSP student representative Tom Pennance blogs about the event here. Another blog was published on the Infectious Disease Hub here. Catch up with all that you missed by reading the blogs! As Tom writes: "all living species are involved in parasitism, so our continued inquisitive nature into everything parasite-related is warranted, and something that Carl Linnaeus would certainly be proud of." We warmly welcome all Symposium delegates with the simple message that ‘all living species are involved in parasitism, either as parasites or as hosts’. This is a universal truth which sets the foundation for discussions at the 2017 British Society for Parasitology Autumn Symposium, entitled “The multidisciplinarity of parasitology: host-parasite evolution and control in an ever changing world”. Without doubt, parasitism is a successful evolutionary strategy but is also part of a broader picture of symbiosis and is a convenient classification of the dynamics of how organisms, big or small, interact. As a metaphor it is tremendously powerful, and regularly used in today’s language to describe significant socio-political events and processes, as societies and nations sometimes negatively exploit others. The agenda of parasitology is exciting, challenging and globally relevant. Nonetheless, today’s Symposium on parasitism also underpins mutualism, those interactions seen to benefit all players. Our meeting is supported by The Linnean Society of London, The Royal Society for Tropical Medicine, London Centre for Neglected Tropical Diseases and International Federation for Tropical Medicine (ITFM). Notably, each has provided much more than goodwill to make this meeting a success and we also thank our guest speakers and all attendees. With the award of IFTM Medal, our meeting celebrates the career of Dr David Rollinson, a former President of the BSP, who has been active in parasitological research for over 40 years and recently received the Linnean Society Gold Medal in recognition for his services to science. Thus our Symposium also seeks to encourage others to devote their careers and efforts to parasitological research. For convenience, we have split our Symposium into three themes but these divisions blur, as well they should, for we encourage cross-talk as much as possible between disciplines. The ‘ever changing world’ hopes to place parasitological research within the new terminology of the Anthropocene and how mankind is altering global environments which may or may not favour parasitic diseases of medical, veterinary or wildlife importance. The ‘multidisciplinarity of parasitology’ encourages synergies between molecular, ecological and social science components that link parasites and hosts into a more holistic appraisal of parasitism. The meeting closes upon ‘host-parasite evolution and control’ to recognise that parasites are not simple self-replicating automata and are very able to respond rapidly to interventions waged against them. It is very fitting to discuss this aspect of parasitism here in the Linnean Society where Darwin and Wallace once read their papers, nearly 160 years ago, on evolution by natural selection. To close, we hope you are inspired by this meeting, form new friendships, enjoy the conviviality of the BSP - especially at tonight’s dinner - and look forward to the production of a special issue of Parasitology resultant from the Symposium’s discussions. The BSP's student representatives, Tom Pennance and Alison Mbekeani, have published a meeting report on the Bugbitten Blog: 'Springtime in Scotland with the British Society for Parasitology'. If you weren't able to attend the meeting (or indeed if you just want re-live the highlights! ), check out their Meeting Report here. 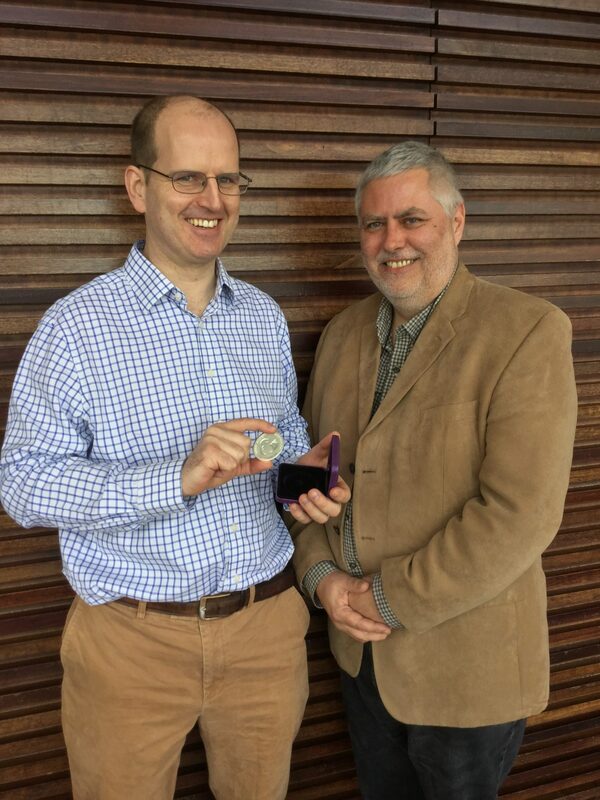 Photo shows Dr Matthew Berriman recieving the 2017 CA Wright Medal - traditionally presented at the annual spring meeting - for his extensive contributions in the field of parasite genomics. The British Society of Parasitology awarded Dr Matthew Berriman the 2017 C.A. 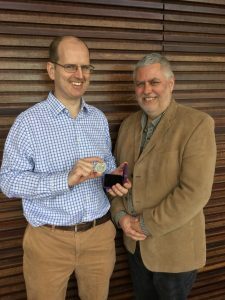 Wright Medal at the society's annual Spring Meeting in Dundee. Dr Berriman is shown receiving his medal from BSP President Mark Taylor. The C.A. Wright Medal is awarded on the basis of an individual’s outstanding contribution to the field of parasitology. Dr Berriman, a senior group leader within the Wellcome Trust Sanger Institute, has played a leading role in the sequencing of genomes from protozoan and helminthic parasites as well as the application of these data in the study of parasite biology, genetics, evolution and adaptation to parasitism. This research has proven transformational in the field of parasitology. The award of the C.A. Wright Medal recognises the impact of Dr Berriman’s research in placing British parasitology at the forefront of international efforts to tackle the health burden attributed to parasitic disease.